Plasmodium falciparum expressing apicopast-targeted GFP in human erythrocytes. A) ACPleader-GFP expressing parasites co-stained for mitochondria (red) [note the right erythrocyte contains multiple ( 5) infections]. B) detection of GFP in the apicoplast (arrowhead) by immunoglod labeling of ultrarhin sections of ACPleader¬-GFP expressing parasites. C) Green fluorescence of FabH¬leader-GFP expressing parasites. D) Schematic of parasite with major organelles. 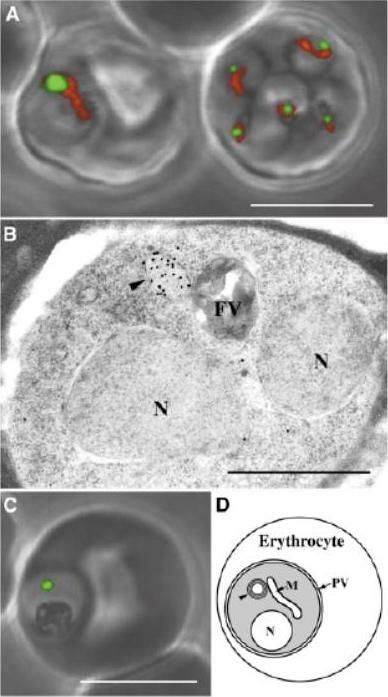 The parasite is contained within the parasitophorous vacuole (PV) inside the erythrocyte. Arrowhead, apicoplast; N, nucleaus; FV, food v acuole; M, mitochondrion. White scale bar 5 mm Black scale bar 1 mm.Waller RF, Reed MB, Cowman AF, McFadden GI. Protein trafficking to the plastid of Plasmodium falciparum is via the secretory pathway. EMBO J. 2000 19:1794-802. 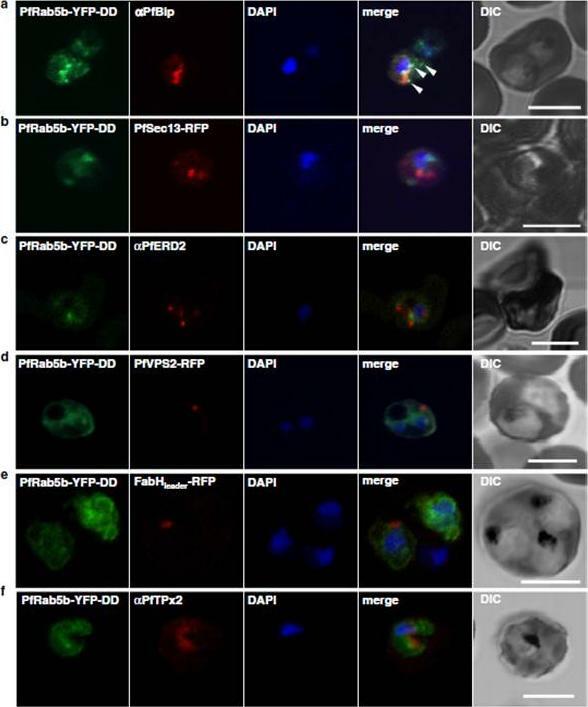 Localization of PfRab5b to a punctate compartment in the parasite cytoplasm. Triple staining with PfRab5b-YFP-DD (green), DAPI (blue) and one of the following markers (red): PfBip (a, ER), PfSec13-RFP (b, ER exit site), PfERD2 (c, Golgi), PfVPS2-RFP (d, putative multivesicular body/endosome), FabHleader-RFP (e, apicoplast), or PfTPx-2 (f, mitochondria) after 24 h incubation with Shld1. PfRab5b-YFP-DD localized adjacent to the Bip signal (arrowheads). Bars 5 μm.Ebine K, Hirai M, Sakaguchi M, Yahata K, Kaneko O, Saito-Nakano Y. Plasmodium Rab5b is secreted to the cytoplasmic face of the tubovesicular network in infected red blood cells together with N-acylated adenylate kinase 2. Malar J. 2016 15:323.